When we're not toiling away designing and printing custom wallpaper, we love to get outdoors, one of the most relaxing activities. Whether you're a runner, hiker, or full blown back country backpacker, you're hard pressed to find the same level of peace and quiet you find when you're alone in the wilderness. Take that feeling you get on the trail and transplant that into your home with a forest inspired custom wallpaper installation. Like people, forests seem to have different moods as the day goes by. At daybreak, bright and clear with lots of activity; like a real morning person. As the day draws to a close, the pace slackens with thoughts of relaxing. The custom wall mural in our inspiration room has this calm evening feel, with fleeting rays of lights peeking in through the foliage. 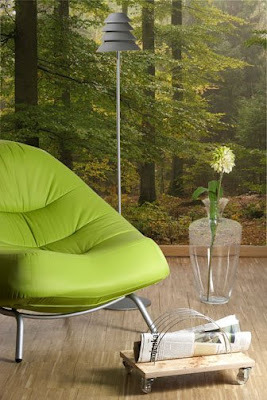 A great way to literally bring the outdoors in, consider using your own photography of wooded scenes. This is the perfect way to personalize your home with custom decor, and will surely give your space a calming atmosphere. Take photographs of your favorite trail and have a wall mural to keep that space close to you, even while you're caught up in the rigors of day to day life.